I have this little set of mini Escada perfumes that I bought from the airport years ago - more like 6 years ago... Dunno why I haven't chucked it. Lol. 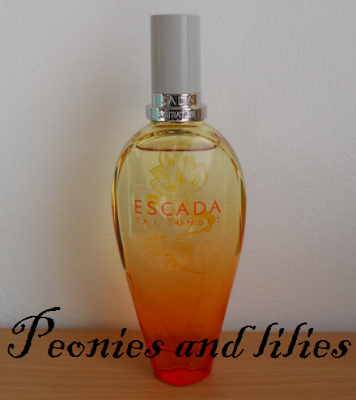 I liked Escada more when I was younger. Haven't looked at them in a while. I think I've moved away from sweet scents. I really want to buy a new perfume but don't know which, I'm super picky. I'd been lemming after DKNY Pure for ages, received it for my birthday and have barely worn it. Still smells lovely but I think I just forget to spray! I have Pacific Paradise and Ocean Lounge. I like their summer fragrances but some of them are too sweet for my liking. Sounds lovely :). I've never tried Escada perfumes.